The basics of sourdough starter are simple. 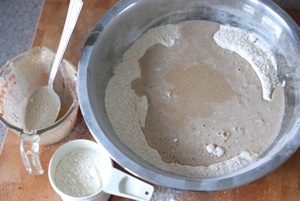 Mix minimally processed grain flours with equal parts water in a non-reactive container with plenty of head space. Cover loosely with a towel or cheese cloth. Wild yeasts in the air or yeasts already resident in the grain will inoculate the mixture and ferment. Stir every day for about a week until the starter smells “yeasty”, slightly sour and looks bubbly. Your sourdough starter is now ready to use and must be fed occasionally to keep it active. I leave my on the countertop and feed it at least once a week with either leftover cooked grains like our breakfast oatmeal, or throw in a handful of various types of grains, all mixed with water to keep the starter a thick liquid. If you get tired of feeding it, put it in a mason jar with a lid and stash it in the back of the refrigerator. Rejuvenate it by feeding it daily at room temperature until it’s once again bubbly.